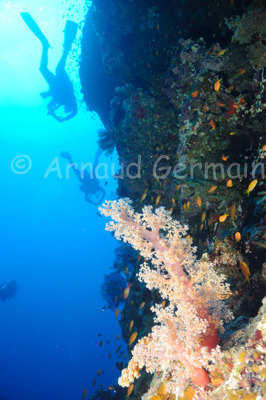 The soft coral on the drop-off on the East Side of Elphinstone reef is covered in soft coral of various colours. I love spending time on the wall trying to capture the beauty of these fragile organisms. I used the widest setting of my lens for this shot, with flash to light up the foreground and wanted the divers in the blue in the distance.